In the 1970’s, Exhaust Gas Recirculation Systems were mandated as a pollution control device to limit the production of oxides of Nitrogen or NOx. The acronym of EGR has stuck with the industry ever since. The basic principle is that exhaust gases have very little oxygen and can be used to cool and control the speed of combustion. Since NOx is directly related to combustion temperature, adding a little exhaust gas to the intake mixture will reduce the overall NOx production. The flip side is that the higher the amount of EGR volume, the lower the combustion efficiency and to a degree, the slower the combustion burn. EGR does not occur at when the engine is cold or at idle, as the lowered efficiency would cause misfiring and elevated hydrocarbons (HC). Besides, in those conditions, the combustion does not really require any cooling to reduce NOx. Generally, EGR does not occur at full throttle, since EGR would reduce the power output and raise hydrocarbons. So EGR is pretty much a mid-range power function. The rpm, load and volume of recirculated exhaust gases varies widely with different engine designs and fuels, and whether the engine has a charger or is normally aspirated. As a loose generality, gasoline engines tolerate between 3% and 15% of the intake volume as EGR gases. Diesels can use up to 3 times that level of EGR gases. The highest EGR volume is during medium load midrange rpm driving. In short, NOx and SOx are oxides of nitrogen and sulfur, and respectively cause nitric acid, nitrous acid and sulfuric acid in the atmosphere. Together these acids are known as “Acid Rain” a type of pollution that damages and kills plant, fish and animal wildlife. Acid rain also corrodes buildings, bridges, statues, and other infrastructures. EGR systems typically reduce the NOx output of an engine by a factor of between twenty and a hundred or more. Converters in the exhaust further reduce NOx and SOx to near negligible amounts. The original EGR system was just a hole between the intake and exhaust ports. There was nothing good about how the engine ran, and they could be really hard to start. When the system first appeared in our fleet in the early 1970’s, it had a valve operated by ported vacuum so it would not function at idle or full throttle, and it had an EGR filter to keep carbon and grit out of the EGR valve and intake manifold. Because one gets 7 gallons of water for every gallon of gasoline burned, the filters would only last a few years before they rusted out in short hop, daily driver cars. By 1975, A vacuum thermoswitch was used to prevent the EGR from operating when the engine was cold. Better control of the EGR valve was accomplished with a vacuum amplifier with an octopus of vacuum hoses. Increasingly stringent EPA requirements led to higher precision systems. EGR Filters were abandoned due to restrictions and holes causing EGR volume failures. The first way to measure EGR flow and assure that the system was working appeared in the late 80’s. Temperature sensors located in the intake manifold directly after the EGR valve could detect EGR activity and estimate the EGR flow volume. It was soon obvious that temperature was not accurately correlated with flow. In the early 90’s, the method changed to monitoring the intake air volume by using the change in the Mass Air Flow Sensor signal (MAF). The EGR volume would be indicated by the reduction of the measured intake air when the EGR system was engaged. That do-the-math method was further refined and is still in use today. It is commonly thought that EGR causes excessive carbon and that the EGR system should be disabled for the best mileage. Reality is a bit different. First one needs to differentiate between the carbon formed inside an EGR system, and the carbon formed inside the intake manifold and the cylinder head intake ports and valves. Exhaust carbon is generally dry and thin, as evidenced by the coating on the inside of most exhaust pipes. This is the normal carbon inside the EGR system of an engine in good tune and condition. Oil consumption and misfiring will definitely cause way worse carbon to form. Combining EGR with the vapors from the crankcase (PCV) results in the gooey black tar type of carbon that builds up in the EGR valve area and on the intake ports and intake valves. The worse the oil and debris in the PCV, the greater the tendency to build up this gooey carbon. It is quite common that the amount of engine wear and damaged oil caused by the factory oil change intervals leads to excessive, acrid and oily blow-by vapors in the PCV and hence to large carbon buildups. When EGR is active on a spark ignition gasoline engine, the throttle plate is open further for the same power output and fuel usage than when the EGR is off. This reduces intake manifold vacuum, which actually increases efficiency. Think of intake vacuum as a force working to slow the downward movement of the pistons during the intake cycle, as the suction creates a backwards force. That is one reason that diesel engines are more efficient than their gasoline counterparts, as diesels have no intake manifold vacuum. Basically, all the energy of fuel combustion is liberated as either heat or mechanical energy. The normal energy balance is approximately 20% as mechanical and 80% as thermal, with the thermal energy divided about in half between exhaust gas heat and the heat of engine parts, coolant and oil. EGR also contributes to efficiency by cooling the combustion temperature, which results in less thermal heat lost through the piston and combustion chamber surfaces, making more of that combustion energy available as mechanical energy. As to the reality of efficiency and mileage, EGR helps during warmup and local driving, but an efficiency loss shows up during prolonged high speed driving. Spark ignition engines loose less mileage than diesel engines. Although manufacturers won’t release data about EGR versus mileage, empirical evidence points to about a 3% loss with diesels and about half that with gasoline engines. A small price to pay to virtually eliminate acid rain. The first Volkswagen diesel engines to have an EGR system were in the 1996 Passat Tdi with its 1.9 liter AHU engine. The EGR valve was integrated into the intake manifold and was not replaceable separately. From 1999.5 through 2003, the ALH Tdi engine with its VNT turbocharger has the EGR valve as a separate unit bolted to the intake manifold. Since diesel motors do not have any intake vacuum, all diesel engines have a vacuum pump for the brake booster, and this vacuum is used to control the EGR system flow in engines from 1996 through 2003. The vacuum is regulated through a solenoid that gets a variable duty cycle signal from the Engine Control Unit (ECU). Since diesel engines have no significant intake manifold vacuum, in these AHU and ALH engines exhaust gases for EGR must be pushed into the intake manifold solely by exhaust pressure. So EGR does not flow during engine loads with any boost pressure that exceeds the slight amount of exhaust pressure that exists upstream the turbocharger in the exhaust manifold. The EGR valve must be closed under boost, or the intake charge will simply vent into the exhaust manifold. All diesel engines incorporate a coolant fed EGR cooler to reduce the temperature of the recycled exhaust gases. 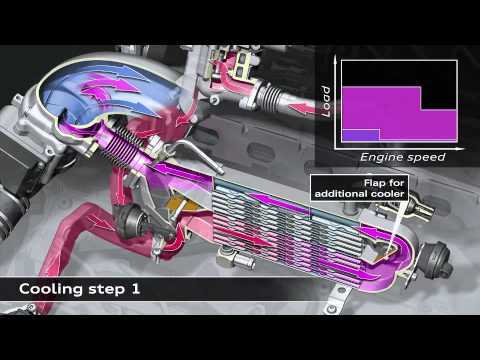 This avoids decreasing the charge density of the intake air, which would somewhat defeat the purpose of the intercooler. Cooling the EGR gases also further reduces NOx as the molecules of EGR gases reduce peak combustion temperatures by absorbing some of the combustion heat. With the introduction of the Pumpe Duse (PD) engine in 2004, vacuum is used to turn the main EGR flow on and off using a valve just before the EGR cooler, but the final EGR flow regulation is achieved using a combination of effects from the EGR valve and the Throttle Valve. The EGR valve is controlled electronically, and EGR flow at partial boost is assisted by tilting the throttle valve to create a low pressure area behind it to pull in exhaust gases even though the manifold is under some boost pressure. The next PD diesel engine series of the BRM and its 2 liter BHW cousin got another vacuum controlled valve to control hot EGR versus cooled EGR to assist engine warmup. Starting with the 2009 Common Rail (CR) diesel, the exhaust gas recirculation system uses two separate systems. There is a high pressure EGR system from the exhaust manifold to the intake like the early BEW PD system with a throttle valve and an electronic EGR valve, but no EGR cooler. The high pressure EGR system meters EGR gases at idle and at low boost pressures. A second low pressure EGR system puts additional EGR gases from the exhaust pipe after the Diesel Particulate Filter (DPF) into the turbo inlet, allowing EGR under high boost conditions. This second low pressure EGR system includes a slide valve in the exhaust to raise the pressure inside the EGR to help control flow. An EGR filter makes sure no particulate matter gets into the turbocharger. A dual pressure sensor similar to the DPF pressure sensor monitors the exhaust pressure before and after the EGR filter. An EGR cooler is used, and it has a precision variable switch-over valve to regulate the exhaust gas temperature and density.